Metro is asking riders to avoid trying to use the rail system west of the Ballston station because of a derailment early Friday. A westbound train derailed near the East Falls Church station about 6:15 a.m. The partial suspension of Metro service will continue "at least through the end of the day Saturday." UPDATE: Metro has updated information about Orange and Silver Line usage this weekend. Riders west of Ballston on those lines are encouraged to use alternate travel options. There will be no train service between McLean and Ballston on the Silver Line and no train service between West Falls Church and Ballston on the Orange Line. Normal service is expected to resume when Metrorail opens at 5 a.m. Monday morning. Bus shuttles have been established between the stations. East Falls Church Station will remain closed. A Metro train derailed in Northern Virginia early Friday, injuring one man and causing delays and disruptions that will continue into the weekend. Metrorail service will remain suspended on the Orange and Silver lines between the West Falls Church/McLean and Ballston stations "at least through the end of the day Saturday," Metro announced Friday afternoon. 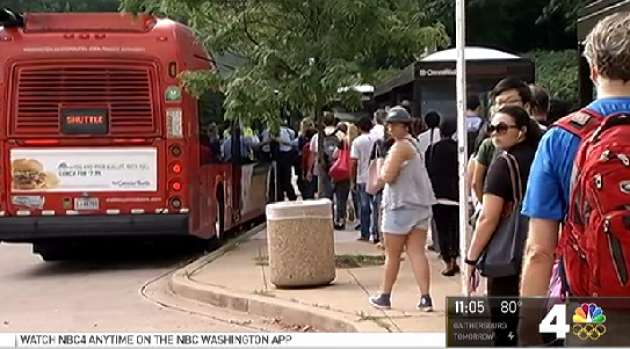 Commuters headed to parts of Virginia during the morning and evening rush hours took Metro trains, waited in line for shuttle buses and then boarded Metro trains again. Commuter Seenu Addandi said his commute from D.C. to Vienna, Virginia, usually takes 20 minutes. 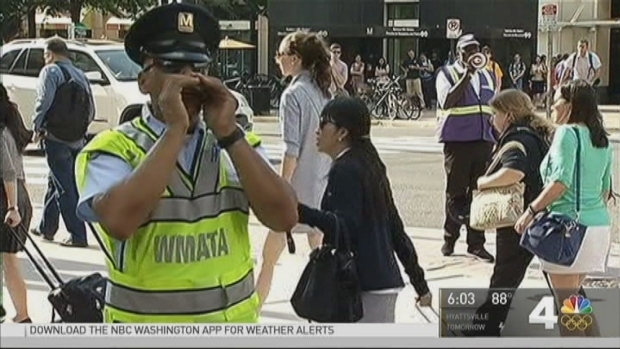 When News4 spoke with him outside the Ballston station during rush hour Friday, the trip had already taken him three hours. "It's messed up," he said. News 4's Chris Gordon looks at the impact Friday's Metro train derailment had on passengers' evening commute. Seventy-five people were on board a westbound Silver Line train about 6:15 a.m. when the fourth and fifth cars of the six-car train collapsed in the middle like an accordion and jolted off the tracks. The train was about 100 feet east of the East Falls Church station. Chandler Davis was dozing on his way to work when he noticed something was not right. "You felt a little rumble and you think it's the normal rumbles, but then it got really bad," he said. "The train car I was in it seemed like it was going to tip over. And then it tipped to the other side. And then when it came to the last side, that's when I smashed my head against the glass," Davis continued. As the train stopped, he heard a hissing sound. "We were all looking around to see what that was that we heard. We didn't want to catch on fire or anything like that," he said. "We were really trying for people to get us out of there." The train remained upright. A Metro employee escorted everyone out of the train within minutes, Davis said. Davis went to a hospital and was told he had a concussion and needs to stay off his feet, he said. No other injuries were reported, according to Metro. Metro General Manager Paul Wiedefeld said it was too early to tell what caused the derailment. The derailed train cars remained on the tracks Friday evening. "We're going to find out what the root cause of this is," he said. "And to do that, we did not want to move any of the equipment until we had that investigation done." The derailment occurred at a "switch-point" where the train moves from one track to another. Metro said the incident happened outside the SafeTrack work zone. The National Transportation Safety Board is sending two investigators to the scene to determine whether there is a need for a more extensive investigation. Officials will investigate, remove the derailed cars and repair infrastructure damaged during the incident, Metro said. A third-party expert also will investigate the cause of the derailment. Metro riders were forced to wait in massive lines after a train derailed at the East Falls Church Metro station Friday. Metro is providing free shuttle buses between the Ballston, East Falls Church, West Falls Church and McLean stations. But riders are encouraged to avoid the rail system if they can. The lines for shuttle buses were long Friday morning and evening. Riders on the Orange and Silver lines have been coping with delays for more than a week. Trains have been running on a single track between the Ballston and East Falls Church stations since July 20 as a part of Metro's fifth SafeTrack safety surge. That work was scheduled to be complete on Sunday. 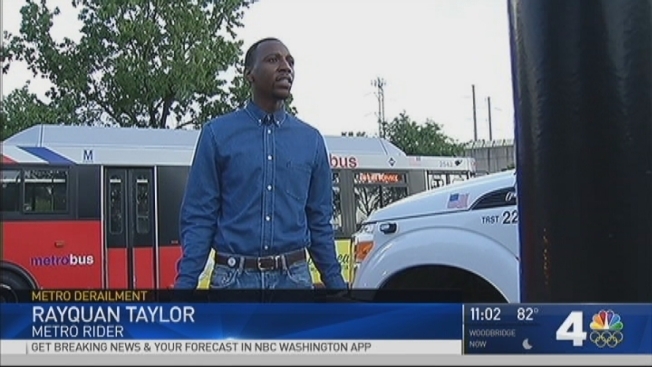 Davis, who was hurt when the train derailed, said he likely needs to keep taking Metro. "I may have to if I want to keep my job, but I'm not really looking forward to it," he said.